Flume is a distributed, reliable, and available service for efficiently moving large amounts of data soon after the data is produced. The primary use case for Flume is as a logging system that gathers a set of log files on every machine in a cluster and aggregates them to a centralized persistent store such as the Hadoop Distributed File System (HDFS). 1. Flume Master: - The Flume Master is the central management point, controls the Flume node data flows and monitors Flume nodes. 2.1 Flume Agent: - The agent Flume nodes are co-located on machines with the service that is producing logs. 2.2 Flume collector: - The collector listens for data from multiple agents, aggregates logs, and then eventually write the data to HDFS. 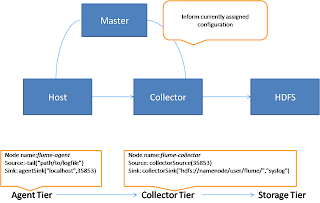 Fig: - Flume processes and there configuration. Before we start configure flume, you need to have a running Hadoop cluster, which will be the centralize storage for flume. Please refere to Installing Hadoop in the cluster - A complete step by step tutorial post before continuing. 1. Download flume-0.9.1.tar.gz from https://github.com/cloudera/flume/downloads and extract to some path in your computer. Now I am calling Fllume installation root as $Flume_INSTALL_DIR. 2.2 After the Master is started, you can access it by pointing a web browser to http://localhost:35871/.This web page displays the status of all Flume nodes that have contacted the Master, and shows each node’s currently assigned configuration. When you start this up without Flume nodes running, the status and configuration tables will be empty. 3. The flume collector can be manually started by executing the following command in another terminal. 3.2 To check whether a Flume node is up, point your browser to the Flume Node status page athttp://localhost:35862/. Each node displays its own data on a single table that includes diagnostics and metrics data about the node, its data flows, and the system metrics about the machine it is running on. If you have multiple instances of the flume node program running on a machine, it will automatically increment the port number and attempt to bind to the next port (35863, 35864, etc) and log the eventually selected port. 3.3 If the node is up, you should also refresh the Master’s status page (http:// localhost: 35871) to make sure that the node has contacted the Master. You brought up one node whose name is flume-collector, so you should have one node listed in the Master’s node status table. 4.1 On the Master’s web page click on the config link. Enter the following values into the "Configure a node" form, and then click Submit. Note: - The collector writes to an HDFS cluster (assuming the HDFS nameNode is called namenode). 5. The flume node can be manually started by executing the following command in another terminal. 5.2 Perform step 3.2 and 3.3 again. 6.1 On the Master’s web page, click on the config link. Enter the following values into the "Configure a node" form, and then click Submit. 7. To check whether data is stored into hdfs or not, you can check it by pointing browser to http://localhost:50070/.